At the end of the Boer War in 1902, all Boer soldiers had been asked to sign an undertaking that they would abide by the peace terms. Some, like Deneys Reitz, refused and were exiled from South Africa. Over the following decade many returned home, and not all of them signed the undertaking upon returning. At the end of the Boer War those Boers who had fought to the end were known as "bittereinders" ("bitter enders"); by the time of the rebellion, those who had not taken the oath and wanted to start a new war had also become known as the "bittereinders". The outbreak of hostilities in Europe in August 1914 had long been anticipated, and the government of the Union of South Africa was well aware of the significance of the common border South Africa shared with the German colony of South-West Africa. Prime Minister Louis Botha informed London that South Africa could defend itself and that the imperial garrison could depart for France; when the British government asked Botha whether his forces would invade German South-West Africa, the reply was that they could and would. South African troops were mobilised along the border between the two countries under the command of General Henry Lukin and Lieutenant Colonel Manie Maritz early in September 1914. Shortly afterwards, another force occupied the German port of Lüderitz. When the South African government had offered to invade the German colonies, the commander-in-chief of the Union Defence Force General Christiaan Beyers resigned, writing "It is sad that the war is being waged against the 'barbarism' of the Germans. We have forgiven but not forgotten all the barbarities committed in our own country during the South African War", referring to the atrocities committed during the Boer War. A nominated senator, General Koos de la Rey (who's grandmother was Johanna Elizabeth Du Buis/De Buys), who had refused to support the government in parliament over this issue, visited Beyers. On 15 September they set off together to visit Major JCG (Jan) Kemp in Potchefstroom, who had a large armoury and a force of 2,000 men who had just finished training, many of whom were thought to be sympathetic to the rebels' ideas. Although it is not known what the purpose of their visit was, the South African government believed it to be an attempt to instigate a rebellion, as stated in the Government Blue Book on the rebellion. According to General Beyers it was to discuss plans for the simultaneous resignation of leading army officers as protest against the government's actions, similar to what had happened in Britain two years earlier in the Curragh incident over the Irish Home Rule Bill. On the way to the meeting General de la Rey was accidentally shot by a policeman at a road block set up to look for the Foster gang. The Foster gang was a group of criminals who operated around Johannesburg and the Rand, during 1914. The gang, led by William Foster, committed various acts of robbery and murder. After a stand off with the police, the gang members and Foster's wife all committed suicide. At General de la Rey's funeral, however, many Nationalist Afrikaners believed and perpetuated the rumour that it was a government assassination, which added fuel to the fire; this was even further inflamed by Siener van Rensburg and his controversial prophecies. General Maritz, who was head of a commando of Union forces on the border of German South-West Africa, allied himself with the Germans and issued a proclamation on behalf of a provisional government which stated that "the former South African Republic and Orange Free State as well as the Cape Province and Natal are proclaimed free from British control and independent, and every White inhabitant of the mentioned areas, of whatever nationality, are hereby called upon to take their weapons in their hands and realize the long-cherished ideal of a Free and Independent South Africa." It was announced that Generals Beyers, De Wet, Maritz, Kemp and Bezuidenhout were to be the first leaders of this provisional government. Maritz's forces occupied Keimoes in the Upington area. The Lydenburg commando under General De Wet took possession of the town of Heilbron, held up a train and captured government stores and ammunition. Some of the prominent citizens of the area joined him, and by the end of the week he had a force of 3,000 men. Beyers also gathered a force in the Magaliesberg; in all, about 12,000 rebels rallied to the cause. The irony was that General Louis Botha had around 32,000 troops to counter the rebels and of the 32,000 troops about 20,000 of them were Afrikaners. The government declared martial law on 14 October 1914, and forces loyal to the government under the command of General Louis Botha and Jan Smuts proceeded to destroy the rebellion. General Maritz was defeated on 24 October and took refuge with the Germans. The Beyers commando was attacked and dispersed at Commissioners Drift on 28 October, after which Beyers joined forces with Kemp, but drowned in the Vaal River on 8 December. General De Wet was captured in Bechuanaland, and General Kemp, having taken his commando across the Kalahari desert, losing 300 out of 800 men and most of their horses on the 1,100 kilometre month-long trek, joined Maritz in German South-West Africa, but returned after about a week and surrendered on 4 February 1915. 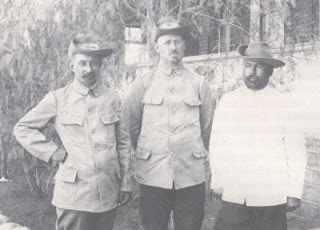 After the Maritz rebellion was suppressed, the South African army continued their operations into German South West Africa and conquered it by July 1915. The leading Boer rebels got off relatively lightly with terms of imprisonment of six and seven years and heavy fines. Two years later they were released from prison, as Louis Botha recognised the value of reconciliation. After this, the "bittereinders" concentrated on working within the constitutional system and built up the National Party which would come to dominate the politics of South Africa from the late 1940s until the early 1990s, when the apartheid system they had constructed also fell.